Online mapping and location technologies are hot topics. As mainstream mapping platforms such as Google Maps™ and Bing Maps™ show consumers the value of maps, the demand for spatially-enabled applications has exploded. Developers are looking to embed maps in their business, government, and consumer applications so they too can leverage the advantages of integrating, accessing, analyzing, and visualizing data. While the benefits of spatial technology are widely recognized, developing robust, intuitive mapping applications has been incredibly challenging; until now. SpatialStream™, a SaaS spatial development platform that provides ready access to sophisticated spatial technology and data in the cloud, is revolutionizing spatial application development. Cloud computing is transforming application development. Using a cloud service means substantial time and cost savings on development, infrastructure, and maintenance, as well as minimal capital outlays and best-in-class reliability. Companies can integrate advanced mapping features in a fraction of the time it would take with traditional solutions. Plus, using a spatial development platform frees your developers to focus on improving the end-user experience. Remember, you don't need to become a GIS expert to leverage location technologies. 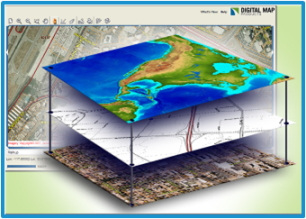 Digital Map Products' mission is spatial technology made easy. SpatialStream™ lets you bring a robust and intuitive mapping applications to market in less time and with far greater ease.